Hello! 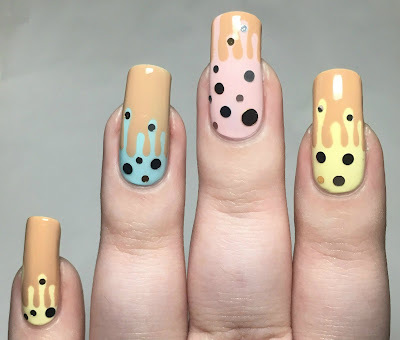 As promised, today I have my nail art for April's 'Soft Scoop' MeeBox. If you missed my initial unboxing and swatches, you can find that post here. 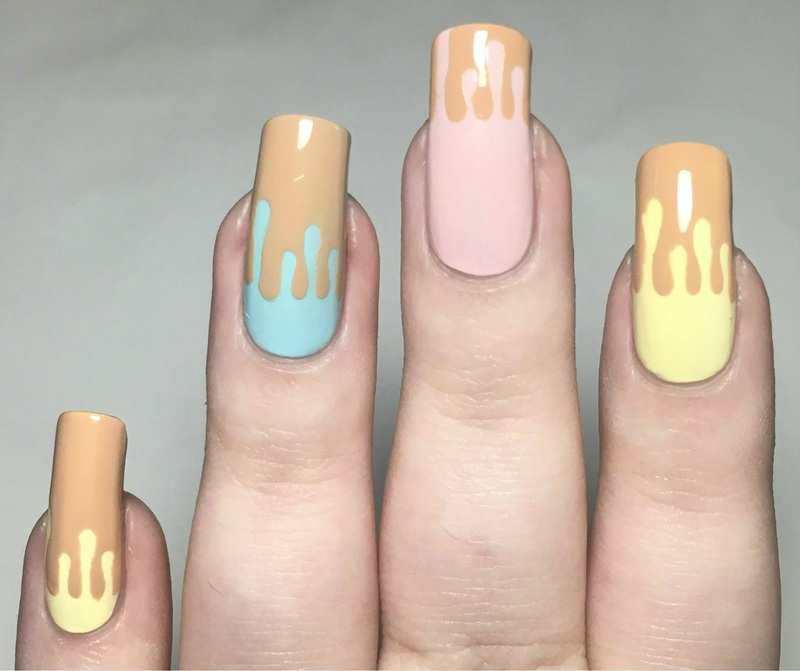 The pastel shades are perfect ice cream colours, and MeeBox even gave us dripping vinyls - so what else could I do except a dripping ice cream mani?! 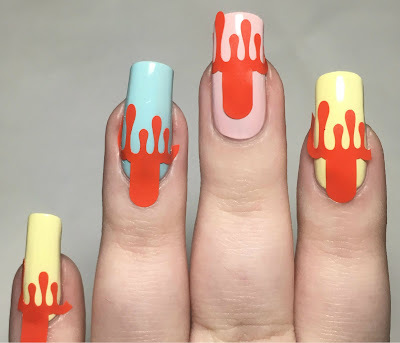 Read on to see how I created the look below. I started off by painting my index and pinky nails with Models Own 'Banana Split', middle nail with Trust Fund Beauty 'Do You Know Who My Father Is? ', and my ring nail with iZ Beauty of London 'Baby Blue'. All are shown below with three coats, and topped with iZ Beauty 'Plump' topcoat. After making sure my base colours were completely dry, I randomly placed one of the Whats Up Nails dripping vinyls on each nail. 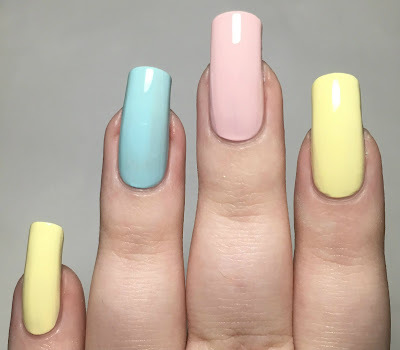 I had a quick look through my collection for an ice cream cone colour, and settled on Barry M 'Sunkissed'. I generously painted over each vinyl to create an opaque colour, and them removed them while the polish was still wet. 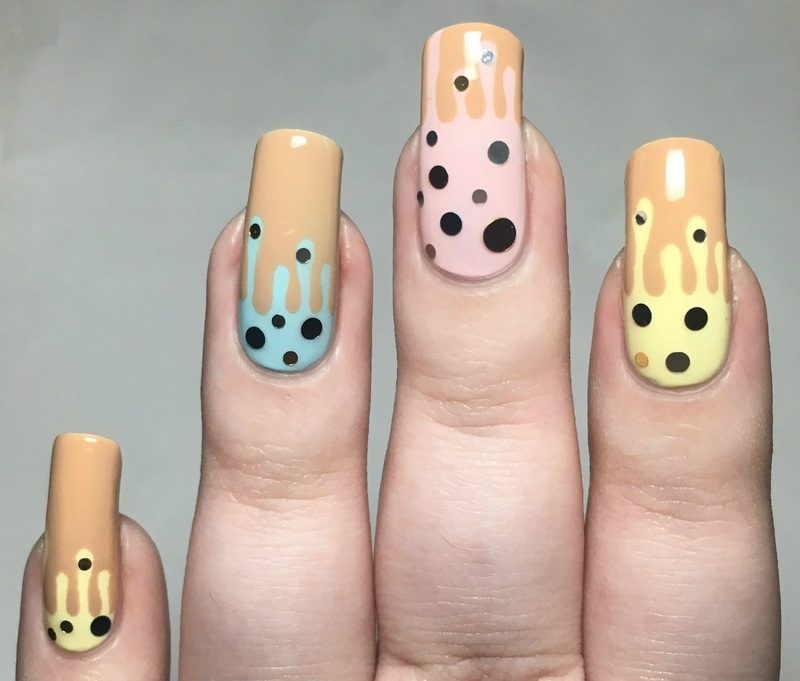 At this point I wasn't sure whether it looked more like chocolate sauce melting on to ice cream, or ice cream melting onto cones - I suppose it depends which way up my nails were! 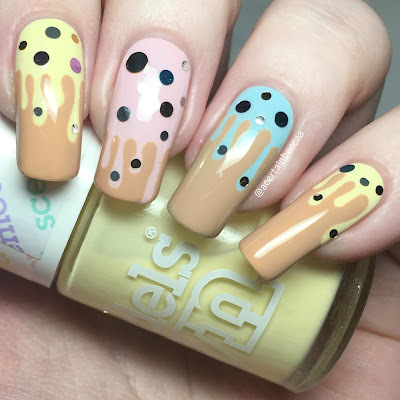 To finish off and make it slightly more obvious, I added sprinkles using the Whats Up Nails neapolitan confetti. What do you think? Aren't they cute! I wasn't sure how the confetti glitter would look, but I'm so glad I added it. I had also intended to use the Zoya Matte Velvet topcoat before adding my sprinkles, but managed to completely forget. Woops! 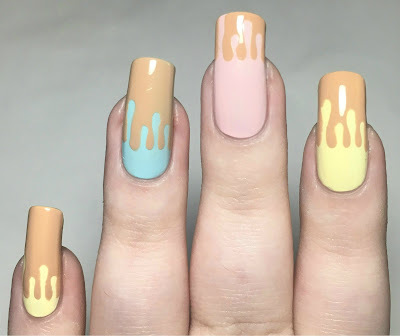 I like to think my melting ice creams would have looked good matte!